We know we have to budget for the things we need. But it always seems to be those pesky wants that get in the way of our financial goals. There will always be things we want. We see new clothing, new gadgets, new places to visit. There are new cars and new furniture. We see what others have and want it, too. If we act on those impulses and buy things we want instead of what we need, we can send our budgets into a tailspin. It’s quite easy to rack up debt with just a quick run to the store or few clicks on your computer. 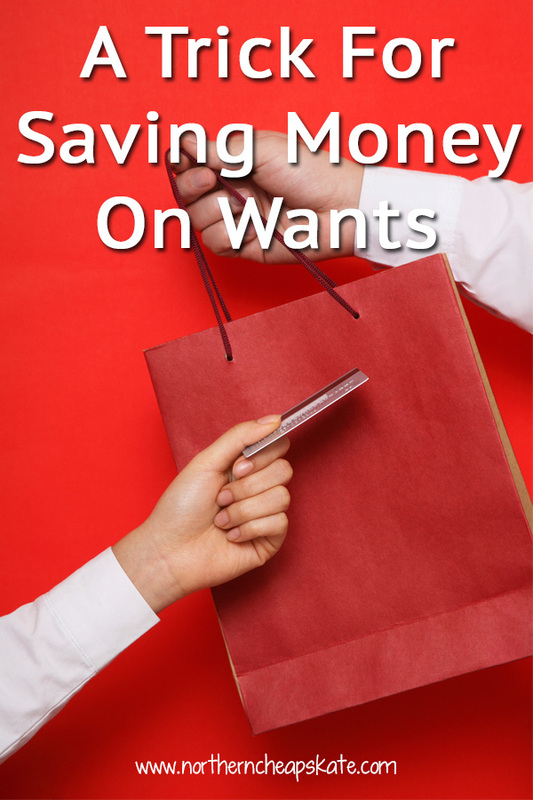 I have found a simple trick for saving money on wants that has worked for me time and time again. It’s super easy, it doesn’t cost a thing and it has saved me from spending hundreds of dollars every year. I’m sure it’s saved me from a few bad impulse purchases, too. The trick: Whenever you see something you want, put it on a wish list. I personally use an Amazon wish list , but there are other wish list websites or you can just use a plain ol’ piece of paper to write it down. Then leave it there for at least a week, but preferably longer. You get the satisfaction of “the click” without spending a dime. When you revisit that wish list later, one of two things will happen: You will make that item a priority for purchase and can figure out how to work it into your budget, or you’ll discover that you don’t really want the item that much anymore and can remove it from the list. I have found that when I put my wants on a wish list, the desire to have them right now fades. It gives me time to determine whether my desire for the item is genuine or whether it’s fueled by marketing or the desire to keep up appearances. It gives me time to consider all the costs of the item. If I determine that I still want the item, I have time to shop for the best possible price or to possibly source local, handmade, or secondhand alternatives. My wish list trick works best for all those impulse buys that present themselves when you’re out and about, but it can help you to prioritize all the things on your shopping list. When you buy yourself some time to consider the true costs of a purchase, you buy yourself a better financial future. Hi! I do the same thing but I put the items in my cart and leave them there until I actually do have to checkout with something I really need – then I move that item to the “save for later”. Every so often I go through the “save for later” stuff – some stuff I keep/some stuff I delete. I also do the same with yarn shopping (I’m addicted to yarn – “I have enough yarn” said no knitter ever!! lol) so I get the satisfaction of looking at the yarns and putting them in the cart and then I never check out and I close the window at the end of the day. Great minds think alike! Actually, I have heard that some companies will actually offer you discounts when you “abandon” your online shopping cart in an attempt to get you to buy. Could lead to some additional savings if you stick to what you really want. Yes, there are some sites that will e-mail you a promo code good for a certain period of time to entice you to complete your order. I’m not sure what sites and how often they would do this, as I would expect there’s some algorithm to prevent you from doing it order after order.